the vast Deserts, the New Mexico Landscape or the East or West Coasts, you never run out of subject matter! 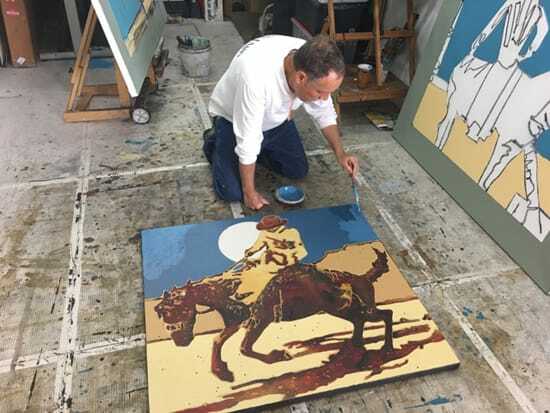 A passionate 'environment' painter, Clive Tyler paints outdoors as much as possible, en plein air, immersing himself in his locales, re-creating the experience of place. 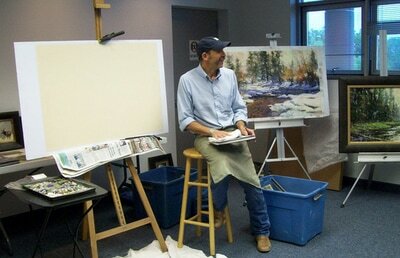 Using pastels, he paints in a classical oil painting style, layering colors on a sanded, German pastel paper. Traveling with a wide range of rich colors, his 'on location' paintings are just as vibrant and full of light as his large studio work. Clive often paints in a series as an effective way of representing the environments he's visited and painted in. His larger studio works are based on his plein air painting experiences. The soft pastel sticks Clive uses are the French brand, Sennelier. It's a dry form of pigment/paint. Pastel is made of pure pigment or ore and stone so the colors glow with a luminous feeling. 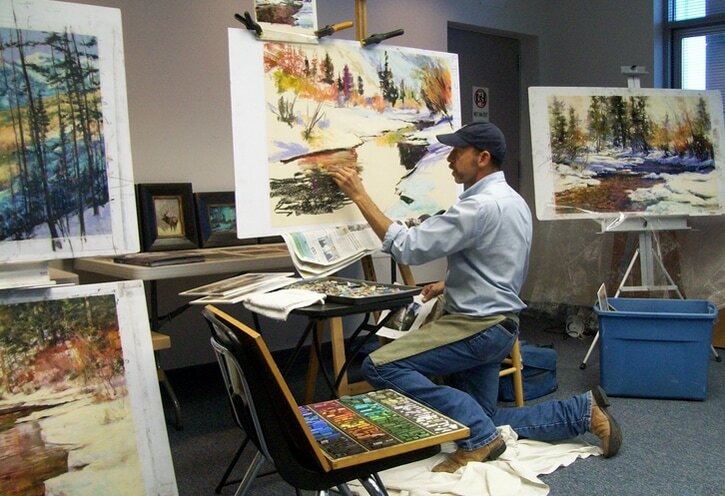 Clive places color loosely, enjoys under painting, and uses edges and emotional strokes in his painting. Up close the paintings take on an abstract feeling but from 10 feet away it looks like your looking through a window to the world outside. After drawing a couple of quick sketches to work out the details, Clive then lays out a strong composition on the sanded paper. Laying in the darks first he begins with the underpainting colors. "I'm painting the experience, not a reproduction of the view. 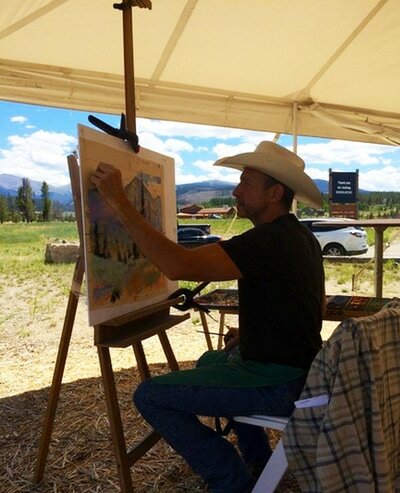 I want to have the viewer want to step into the painting, look around the corner, feel like they are looking up at the aspens, sense a feeling of the time, feel the temperature of the day, hear the sounds of leaves and thunder in the distant storm. 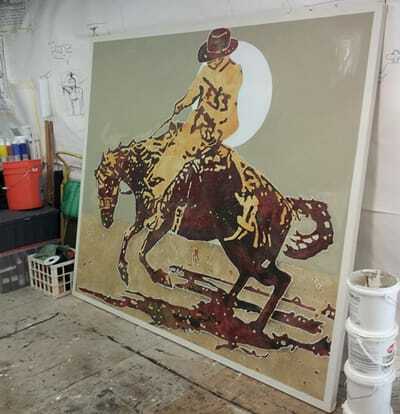 Through color harmony, pastel pigment, texture, and a strong concept with good design and composition, I convey this to the viewer and evoke some memories or desires." 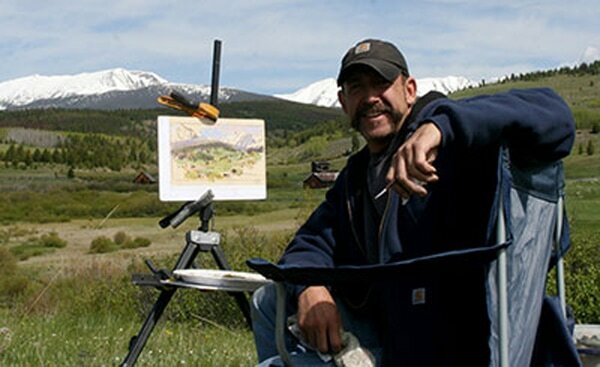 I wanted to share a little insight with you about one of our Gallery Artists, Michael Swearngin, Contemporary Western Painter. I'm asked many questions about our roster of artists,but one is frequent; how does the artist create their work and where do they create. Each artist has their own unique way of creating and unique studio set up. 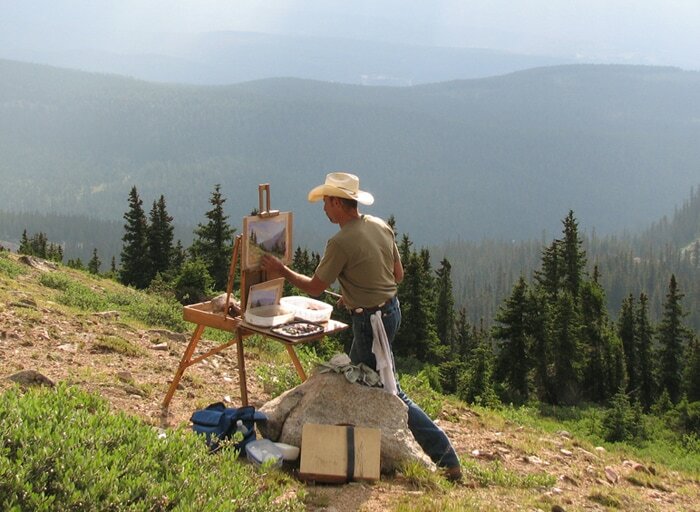 Some do most of their work in the great outdoors on location and others create in their studio, their creative space. Some, like Michael, always have a sketch book and sketch wherever they are, combining on-location work with studio work. 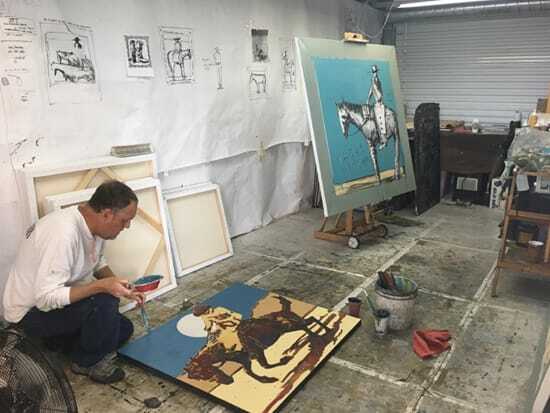 Michael Swearngin is a mixed media artist, driven by design, using simple shapes to establish a strong composition on the canvas. While traveling, Michael sketches, whether in the mountains in Colorado, the coast of California, the local resorts in Scottsdale (where his studio is) or on ranches in Arizona and Texas, creating a visual Journal. Because the sketches are done on location they have a lot of energy and life. Once back in his studio, the sketch book helps Michael reflect on his experiences and the studies are often posted on the walls. These studies help inform the drawing Michael executes on the canvas. Once drawn on the canvas he then works the under-painting (with brushes) with dramatic color and texture for a high visual impact. Michael's desire is to share life visually with you through his adventures, travels and experiences from his studio to your home. Nancy Smith delivered 5 new paintings within the last week. Be sure to stop by the gallery to see her latest plein air oil paintings. Take advantage of our gallery specials and perks thru Jan. 11th. Purchase your favorite artwork with Check or Cash for Special Gallery Savings and Perks! 2nd Gallery Raffle on Saturday, Jan. 10th. Come by the gallery to enter. Our Open House is Friday and Saturday 10am-5pm and Sunday 10am-3pm. So many fabulous, artful gifts to choose from! Take advantage of our Holiday Specials and Reduced and Free Shipping Options! Paintings, Pottery, Jewelry, Photography, Sculpture, Bronze door knockers, Photography art books by Christopher Briscoe, leather purses by Donna Howell-Sickles, Tiles by Nora Larimer. The Gallery is Open Monday & Tuesday 10:30am-5pm and until Noon on Christmas Eve. View the website for available paintings and sculpture. Call the gallery and I will send jpgs of the Pottery and Jewelry we have on the shelf. Give the Gift of Art! - Cynthia Wolf - Spreading the Joy thru Art!